Add color and personal charm and value to your home. Excellent for floors, walls, backsplashes in kitchens and bathrooms. Use with other complementary stone or ceramic field tiles for dramatic installations. All natural stone has substantial shade variation. Recommended for kitchen backsplashes, showers, accent walls, tub surrounds and vanities, penetrating sealers recommended before grouting. Recommend white polymer-modified thinset and sanded grout for best installation results. 1 square foot, 2 pieces per pack. Pack weight is 4.60 lbs. Buy online Jeffrey Court 6 in. x 12 in. 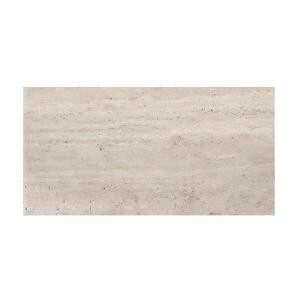 Honed Travertine Field Wall Tile 98994, leave review and share Your friends.